Would you like to help us reduce loneliness and integrate communities - whilst having lots of fun? Become a volunteer. Age segregation is a huge problem for the UK and it’s been getting worse for 25 years. 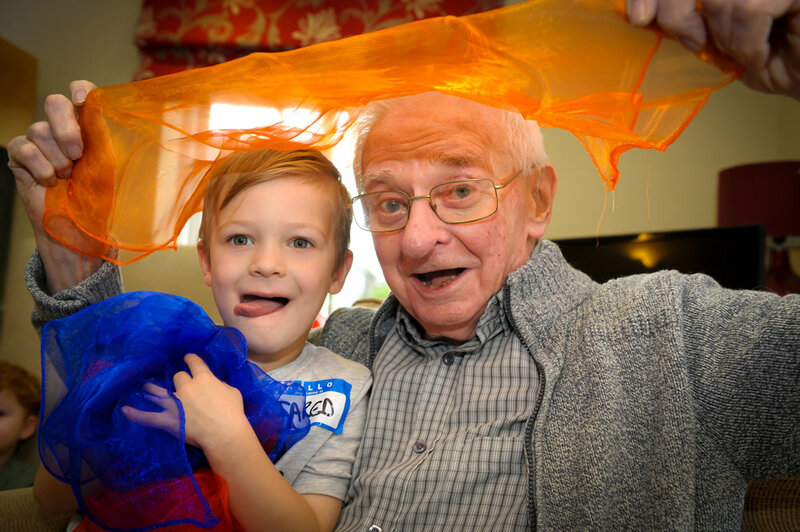 The Together Project runs intergenerational activities that reduce loneliness and bring joy to people’s lives. Donations are an incredibly valuable source of income for us. Your generosity could help train volunteers, buy equipment and pay for the essentials to keep us running. We have lots of exciting plans that we'd love to let you know about. Sign up to our mailing list for updates on our work. We received £10,000 in match funding from a combined Trust For London/City Bridge Trust grant in 2017. Thinking of bringing your little one to Songs & Smiles? Read our guide to find out what happens and for some tips on getting the most our of your visit. We received £10,000 in match funding from the Santander Changemaker fund in 2017. We live in an era in which many members of our society feel isolated, ostracised or misunderstood. The Together Project believes that social integration is key to breaking down the barriers that keep us apart.